Office Furniture, Storage Cabinets, Computer Furniture and More! What does your office look like? Whether it’s in your home or it’s that nice corner office with the view, you want it to be a professional-looking, well-thought-out, spectacularly designed and high-functioning office. But where can you find a place to buy all of your office furniture, computer desks and office chairs that will meet all of those criteria at once? 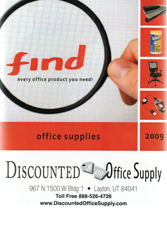 Discounted Office Supply.com is just the place. We take pride in our large selection of computer desks, office chairs, storage cabinets and computer furniture at great prices. Our complete inventory will have your office looking great in no time-for yourself as well as your clients. Browse the categories below and we’ll ship to you within the continental United States from one of our 36 geographically placed distribution centers.